Cottage Elements: An Amazing Weekend in Oronoco! It was truly an amazing weekend. 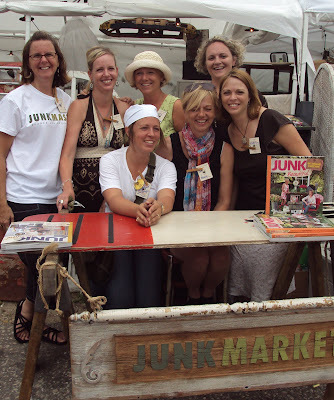 I was able to spend some quality time with my fellow Junkmarket Contributors and finally meet them face-to-face. We were getting together to attended a Blogger Party hosted by fellow contributor, Amy, of Whisperwood Cottage and Junkologie was being held at Gold Rush Days in Oronoco, MN, where they take over the entire town for a once a year flea market. It was an awesome experience! And the weekend was totally jam packed, of which I am thoroughly and completely worn out. But it was so well worth the trip and I have made some life-long friends. The festivities started on Wednesday night with a sleepover at Ms. Sue Whitney's of Junkmarket. I unfortunately was unable to attend (whoa is me), but I guess I missed out on a hoot of a time. Cathy Stantz and Candy Kidd Allen, fellow contributors from Ohio, drove in Wednesday night and were joined by Amy and her husband, Ron, from Duluth. Local contributor, Gretchen Schaumann, arrived later in the evening. They had so much fun sharing and being a little crazy, they didn't even get to bed until 4:30 in the morning! Oh how I wish I could have been there! Thursday morning, or actually afternoon (their late night made them a wee bit late) we met up at the French Flea Market of Anoka, where I was doing my morning shift. After some shopping there, it was off to my house for a little brunch. Then off to more shopping for them at Hunt and Gather in Minneapolis. I unfortunately stayed back and cleaned, later meeting up with them at Sue's. After a little more chit-chat, we were off to Lake Minnetonka to meet up with Kimberly Melamed, also of JMS, and her MIL, Lisa, for a night on the lake in a pontoon. How fun is that? With a little wine and hors devours before hand, we headed towards Lord Fletchers for some dinner. And if you've ever been to Minnesota, you have to have the Walley dinner. Mmmm. It was a great time, sitting outside, viewing the lake and spending time with friends. That is until the racoon's showed up. Ha! But they were so cute! Ahoy, Matte'. Kimberly coming to pick us up! What a lovely spred they had waiting for us! Gretchen, Candy and Kathy enjoying a beautiful night on the Lake! And what's a Minnesota Lake without a loon? On Sue's porch before we leave for Oronoco! Another night up talking (this time only 'til midnight) and up early to be off to Oronoco! Well, maybe not so early. Our plans were to be up and gone by 7:00 or 8:00. So 11:30, that wasn't so bad, now was it? And after a two hour drive, we were off for a day of shopping! Oh, maybe not quite yet. After reserving our campground ahead of time, we came to find out it was about 40 minutes away. Oops. Luckily the Pfarkel Sisters had our back. They were staying at a site only a hop skip and a jump away from Oronoco and there was room. Wew! Were we lucky! 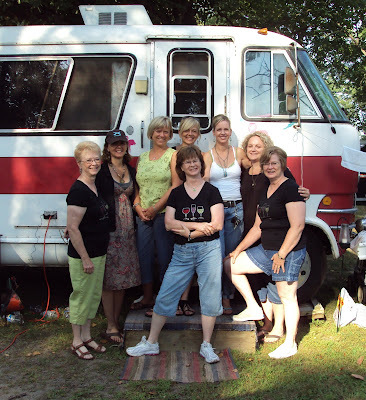 The JMS Contributors and the Pfarkel Sisters in front of their vintage bus! The inside of the Pfarkel's vintage bus. They have a pink flamingo theme! Love it! These great chairs were found curbside. They were in mint condition! So do I fit in??? Well, I'm totally exhausted and I need to recoop from the busy weekend. That's just the first part of my adventure, but stay tuned for my finds and more on the Junkologie Blog Party. I'm so excited to share more! Looks like ya'll had way too much fun, which is always good for you! What a fun time we had! I'm so glad I was able to make it after all. Great recap, Lani. I agree with Gretchen...I may just direct traffic straight to your blog instead of putting something together on mine. ;) Good times. Lol. The word verification for leaving a post on your blog is "compers". Of course I read it as "cAmpers". Haha. So great to read about this fabulous time......so wish I had been there.........BUT...what a cranky gal I would have been with so little sleep (guess you are all lucky I wasn't there!!!). Thanks for sharing the fun Lani. Too much fun! How could you have had any energy left to shop Oronoco? Can't wait to see what you found. Wish I could of been with you again this year. Nobody wanted to go fishing? It most of been so fun to hang out with all your junk creating buddy's. I'm glad you got to go.